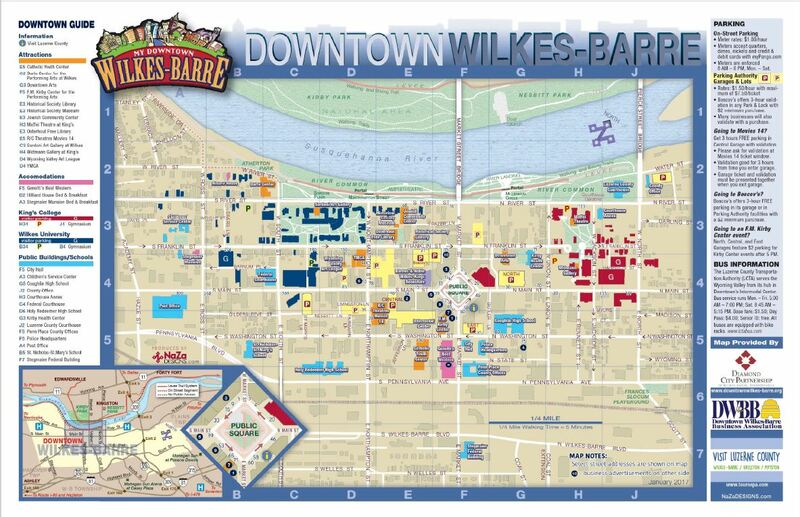 WILKES-BARRE — The Holiday Pop-Up Shops are returning to downtown Wilkes-Barre. To kick off Small Business Saturday on Nov. 24, a ribbon-cutting ceremony will be held at 9:45 a.m. for the shops in the Midtown Village on South Main Street, followed by special events at the F.M. Kirby Center. Shoppers are promised savings from small businesses all day. Mayor Tony George will preside at the ribbon cutting. The event is being coordinated by the Diamond City Partnership, the Greater Wilkes-Barre Chamber of Commerce, the F.M. Kirby Center for the Performing Arts, the Downtown Wilkes-Barre Business Association and the City of Wilkes-Barre. Some 11 different anchor Pop-Up Shop vendors will give shoppers a new array of retail choices, provided by some of the area’s best independent retailers. Sponsored by the PPL Foundation and with partner Insalaco Development Group, the shops will be open Fridays and Saturdays, 10 a.m. to 6 p.m., and Sundays, noon to 4 p.m., from Nov. 24 to Dec. 23. Parking will be validated in Parking Authority facilities with a Pop-Up Shop purchase, and Midtown Village will host a series of special events throughout the shops’ run. Themed weeks will include Deck Your Halls, Sparkles & Spirits, Christmas Candyland, and ‘Twas the Weekend Before Christmas. After the ribbon cutting, Saturday’s action shifts to the Kirby Center for the third annual Holiday Arts Market from 10 a.m. to 5 p.m. — with a special $3 screening of the classic 1947 holiday film, “Miracle on 34th Street,” on the Kirby’s big screen at 2 p.m. Also at the Kirby: a make-an-ornament station, a coloring table, and the Kirby’s own tree lighting at 1:30 p.m., accompanied by local holiday performers and a visit from Santa. Throughout Saturday, over 50 small businesses, both in the downtown and throughout Greater Wilkes-Barre, will offer special deals or discounts. Maps of all participating businesses and their deals for the day will be published in local media and on Facebook. The Pop-Up Shops proved popular last year. Larry Newman, executive director of the Diamond City Partnership, said the shops drive additional traffic to existing downtown retailers and restaurants while providing the participating Pop-Up retailers with an opportunity to test-drive a storefront. For a list of participating “Shop Small” businesses and Pop-Up Shop vendors, visit @DiamondCityPartnership on Facebook.